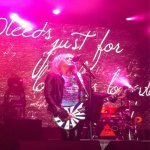 Def Leppard played a show in Gilford, NH last night and the first fan photos have been added. Live Blogger Michele submitted some great photos from the show which took place at Meadowbrook and have been placed in a gallery. Visit the show page to view these photos.